Our Heaven & Earth CMHC Sea Of Tranquility Formula is specially designed to regulate the entry and flow phase of a menstrual cycle. It is highly beneficial as it immediately prepares a women for the opening of the sea of life. The regulating of this physiological function is essential to superior health. 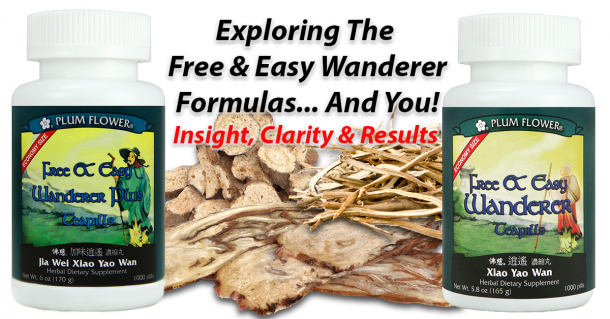 There are key Chinese Herbs that are in this specialized formula to assist in opening this internal gate. For many women this is often a problematic phase in the process of menstruation. When stagnation blocks the internal gate from opening properly, severe cramping often results. Not only does pain occur, but a their may be an inconsistent start date (irregularity). Old blood at the start of a menstrual cycle that is odorous and brown in color may appear. Women will often describe this experience as a slow start. Sometimes the slow start can begin 24-36 hours prior to Day-1 [actual start of flow]. Even if you do not experience the initial blockage of the life gate at the start, it is always prudent to assist this process along. This means nurturing a healthy and regulated menstrual cycle with the help of our Sea Of Tranquility Formula. The dominant presence that menstruation has in a woman’s lifetime merits the thoughtful consideration to invest in the promotion of this vital aspect of health! 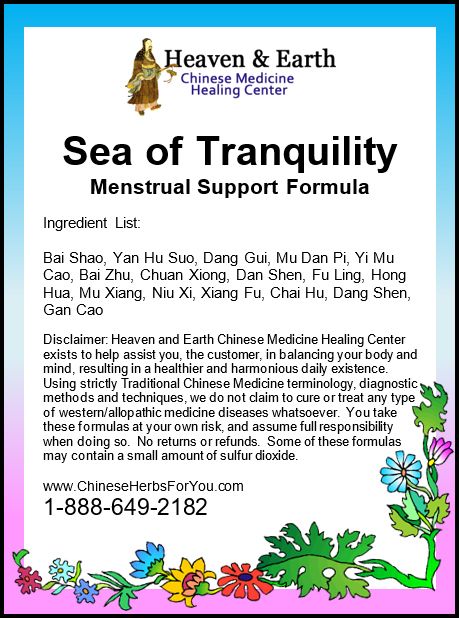 Once the menses are flowing, the Sea of Tranquility Formula is designed to continue the regulation and smooth flow of your menstrual cycle. It helps to create and maintain an even experience on ALL LEVELS. Many women experience inconsistent flow oscillating between gushing and absent menses. This, to a great degree, is a result of the Liver Organ System not properly regulating the flow. Dry spells in the middle of a menstrual cycle often creates a need for your body to essentially re-start the menses. This will often cause severe cramping and pain. 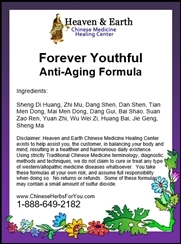 Specialized Chinese Herbs in this formula also helps to break up Blood Stagnation. Blood Stagnation is a real problem due to its direct contribution to pain, cramping and an inconsistent flow.